Don’t Workout, Play! 2 Tips to Stay Motivated and Get Fit. How is that New Year’s resolution going? Is the fervor with which you made it starting to wane a little? Has it waned a lot? How do you keep motivated when chasing your kids all over hell and half of Georgia and don’t have time to make a healthy snack, let alone meal? Truth is, you have to make the time to be healthy a priority. It’s an appointment you must keep with yourself and make others respect. Is time not your enemy, but staying motivated is? A terrific way to stay on a fitness routine is to join a team or train for a specific event. It lends some purpose, intent and accountability to your fitness routine. Here are a couple of ways to get out of a fitness rut and infuse that workout with a different purpose- one of fun and play! -Check out a slow pitch softball league in your area. You could even organize a team of your coworkers. -Join a running club. Members meet up once or twice a week to run and split into pace groups depending on where you are in your training. There will definitely be a beginners group, so don’t be intimidated or think you have to first get in shape to participate. -Try out a martial arts class- yes they have them for adults. A lot of dojos offer a cardio kickboxing class. Start there, get to know the place and ease into other classes. Most dojos offer several disciplines these days and you usually get a week free to see if you like it. Tae Kwon Do is a great discipline for adults. Also, try out jiu jitsu. You can train in a gi (uniform), or no-gi. Most women are more comfortable starting out in gi. -Do crossfit. It’s a great way to learn how to lift weights in a supportive environment while keeping track of your progress. The only competition is with yourself. You will find yourself trying to get stronger and more fit to match and beat your previous times. Crossfit gyms are full of moms getting in shape. Go check one out. -Register for a road race. 5K, 10K, half marathon, full marathon- whatever size goal you want to go after. Download a training schedule for free online, let people know you’re doing it (for accountability), and start training. My mom never ran a recreational step in her life. She decided to train for a 5K, did a couple of those, and decided she wanted an epic challenge for her 50th birthday, so started training for a marathon. Her first runs were more walks with a block of jogging thrown in, but eventually she was jogging with a block of walking thrown in. Within four months she was going on 15 mile training runs and finished her first marathon. 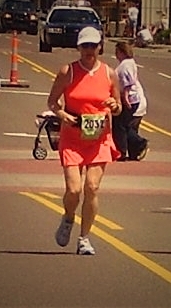 My mom running in her 50th birthday marathon. -Try out an obstacle race. They are all the rage right now, and for good reason. They make exercise fun! Do an internet search for obstacle races coming up in your area and choose the one that looks fun. Get a group of girlfriends together and train. You will have a blast! Once you get a larger goal, losing weight and getting in shape become less of the focus and more of a nice side effect of just being active. When you train for something else, you naturally become conscientious of your diet and strength, because improving these will improve your performance. Or, you’ll see that if you can do this without changing other habits how much better you could perform if you just cut out the extra sugar in your diet, or if you ran one extra day a week. You will think more about fitness than losing weight, which is a much healthier outlook. The goal is to have fun. The goal is to go out and play! For more advice, tips and just general help getting started, give me a shout over at thetomboymommy@gmail.com. Free advice, people! Seriously, I’d be happy to help you out. You can always just drop a comment below too. I love these ideas! They are definitely great way to keep you motivated and dedicated. Thanks for sharing!